The U.S. economy expanded at a slower pace in the second quarter as a softening job market prompted Americans to curb spending. Consumers are cutting back just as Europe’s debt crisis and looming U.S. tax-policy changes dent confidence, hurting sales at companies from United Parcel Service Inc. (UPS) to Procter & Gamble Co. (PG) Cooling growth makes it harder to reduce unemployment, helping explain why Federal Reserve Chairman Ben S. Bernanke has said policy makers stand ready with more stimulus if needed. 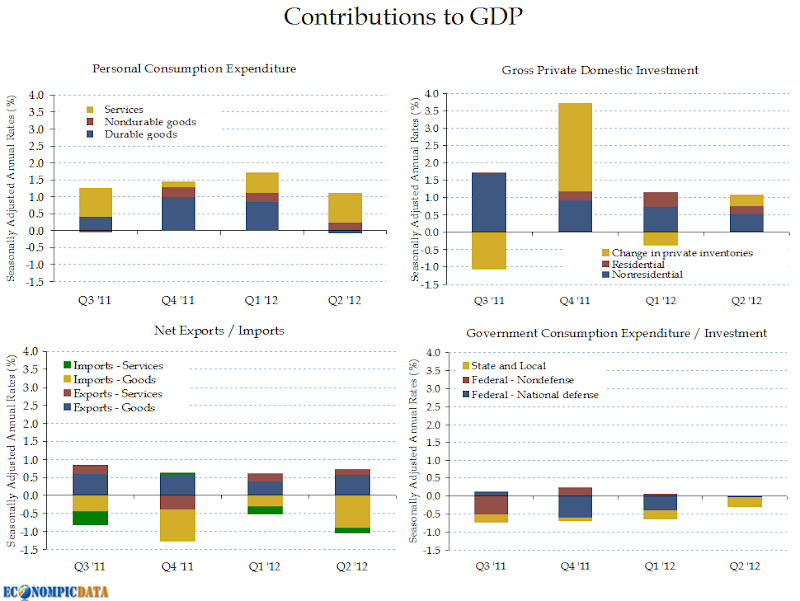 Looking at the data, we see the declining contribution by consumption, offset in part by a quarter over quarter (small) rise in investment and a less negative impact from government cuts (i.e. addition by the elimination of subtraction). Overall, considering what was going on during Q2 this report isn't awful, but certainly isn't encouraging considering we are now three years out of the recession.